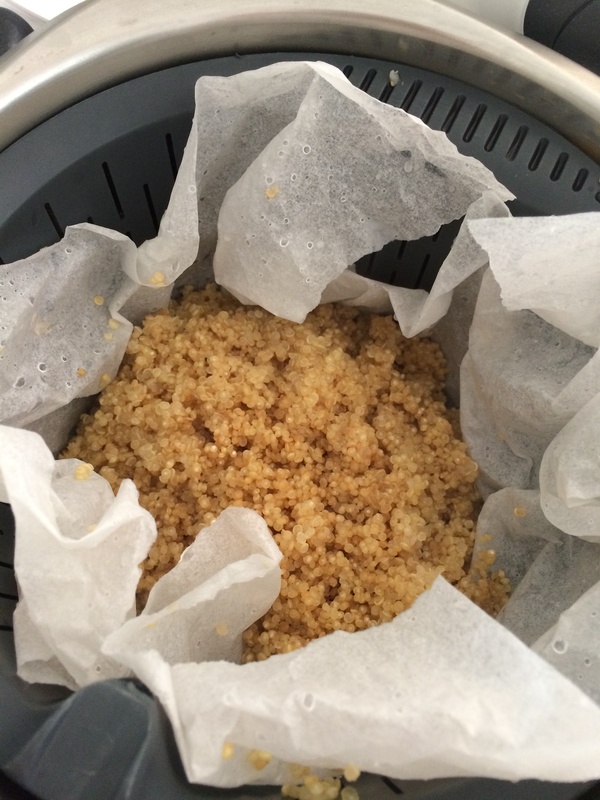 The last time I followed one of the thermomix guides to cook quinoa a lot fell through the holes in the steamer basket into the bowl and then was difficult to retrieve. Found this method from lalanie kitchen blog a lot simpler. Rinse the quinoa ( used 100g) then soak in water for 15 minutes. Add 1ltr of water to TM bowl. Soak and crumple a piece of baking paper, line the steamer basket with the wet paper. Put the quinoa in the steamer basket insert in TM bowl and steam 20 mins, varoma temp, speed 2. Perfectly steamed quinoa, easy to lift out and transfer to serving bowl. Mixed through Moroccan salad in the post below.